This carpet is one of the best known and most highly respected examples of the classic era of Persian carpet weaving (the sixteenth and seventeenth centuries). The six column-like cypress trees in varied blue-green shades form a striking symmetrical arrangement. Originally, the carpet was almost forty feet long, twice as long as it now appears. 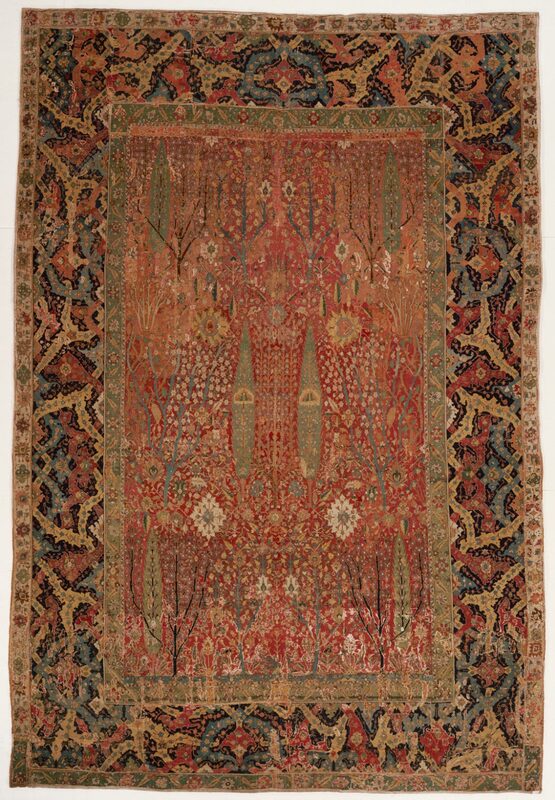 Less than half of the original forty-foot length of this Persian tree carpet, one of the showpieces of the Museum's outstanding rug collection, survives, with only the lower section of seven rows of cypress, almond, and other trees remaining. The bottom row is bounded by a blue ribbon of water, and the whole garden scene is surrounded by several "walls." 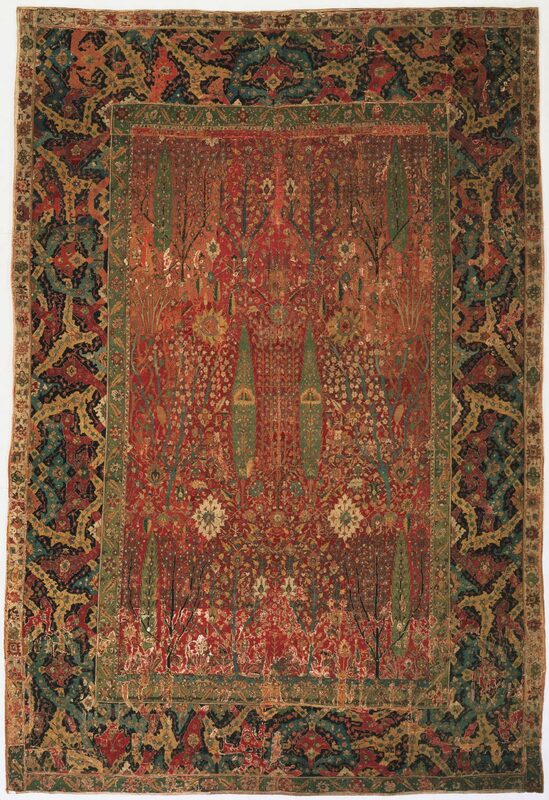 This elaborate and unique carpet pattern was first exectued by one of the painters in the Persian court and then woven and knotted by highly skilled craftsmen. The exceptionally high number of knots per square inch (225) produces the subtle variety of colors and the meticulous definition of the trees and blossoms. The Persian word for "walled garden" also means "paradise," and the representation of a garden on this imposing carpet must surely have been meant to summon up visions of an ideal eternal life where luxuriant trees and fragrant flowers bloom year-round. Felice Fischer, from Philadelphia Museum of Art: Handbook of the Collections (1995), p. 65.